﻿Before starting to draw a project you usually set up your own working environment or so-called AutoCAD´s workspace. Meaning, you display ribbon ﻿tabs and panels, ﻿toolbars, menus or palettes that you need for a quicker access to commands. However, your settings aren´t always preserved. If many people use the same program, they are likely to adjust workspaces according to their own ﻿use. Or, if the program crashes, it might re-open showing the default workspace. To save time from constantly reorganizing your workspace, it is best to simply save it. 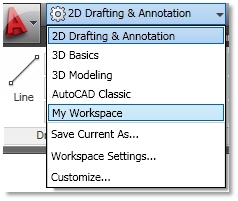 AutoCAD already offers a few predefined workspaces. 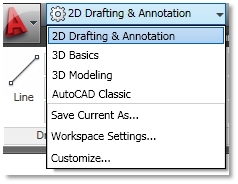 2D Drafting & Annotation - Common ribbon tools for 2D drawings. 3D Basics - Basic ribbon tools for creating and viewing 3D models. 3D Modeling -A full set of ribbon tools for 3D modeling, viewing and rendering. 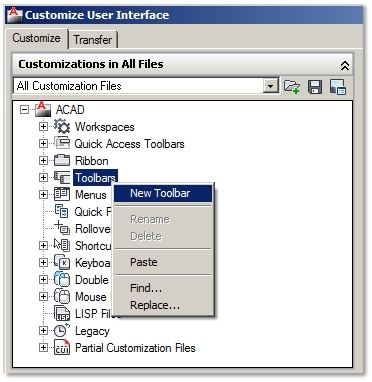 AutoCAD Classic - Workspace environment (previous to release of AutoCAD 2009) with classic toolbars and no ribbon tools. 1. Set up your working environment. If you made some changes to your workspace, you can save them the same way as you did when creating it for the first time. In Save Workspace menu you select the name of your workspace and confirm to replace first settings. Throughout multiple projects you have probably developed a certain drawing style. This applies to Text Styles, Dimension Styles, Table Styles, Linetypes, Title Blocks, Units, Fields and lots of other settings that you use in your drawings. As they are quite complex to set them up, you can lose a lot of valuable time preparing them from scratch every time you start a new drawing. AutoCAD offers many predefined drawing templates (.DWT) with different settings that you can use when you start a new drawing. If these settings aren´t your style, it is best to make your own .DWT file, so that all your settings are already available when you start a new drawing. 1. New / Open a predefined Drawing Template (.DWT) that is closest to your settings. 2. Set up your own settings (Styles, etc.). 4. Saved .DWT file is still opened. Close it to avoid unknown changes. 5. New / Your saved Drawing Template is available for new drawings. 3. Save / Close your .DWT file. 1. Zoom – rolling the mouse wheel you can zoom in or out. Zooming is always central to your mouse cursor. ZOOMFACTOR system variable controls the magnification of one scroll. 2. Pan – holding the mouse wheel you can move your drawing display, as if you moved a sheet of paper. 3. Zoom Extents – double click zooms all object in your drawing to display. 4. 3D Orbit – holding Shift key and mouse wheel simultaneously you can get a 3D view of your drawing. Command lines take a significant part in textual communication with the program. 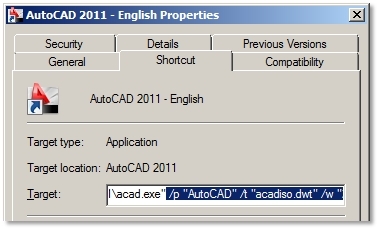 Beginners often get stuck with AutoCAD commands as they forget to look at the bottom command line window to read what they are asked to perform. A Dynamic Input function made it easier for them as it ´moves´ the active command line right next to the mouse cursor where our eyes are focused at most of the time. On the contrary, active users who have no problems following the command line are mostly annoyed by the text window flying around the screen as we move the mouse. Well, both users can benefit much more from Dynamic Input. Relative inputs are visible next to the mouse cursor in boxes. Blue input is active and grey is locked. You can activate inputs by pressing Tab key. The old-fashioned way to draw a line at an angle would be to type one of the formulas: @x,y (@ meaning relative input and x/y relative distances in x and y direction from the last point) or @length<angle. In both cases you had to be careful about positive/negative distances and angles. With Dynamic Input you can reduce typing characters only to inputs. 1. Select a command, e.g. Polyline and specify start point. 2. Instead of typing @x,y, type only x,y and press Enter. Angle direction is defined by typing positive/negative x and y distances. 3. Instead of typing @length<angle activate (Tab) the length box and type in value. Activate (Tab) angle box and type in value. Press Enter. Angled direction is defined by pointing your mouse cursor in a right direction. If you check one or two object distances using commands Measure Distance or various Dimension commands, you´ll find it much easier and faster using Dynamic Input. 1. When no command is active, select an object, e.g. Polyline. 2. Move your mouse cursor on a blue grip. 3. Distances of adjacent segments automatically appear on the screen. With DesignCenter you can easily insert raster images or other drawings as blocks or references. However, this is not its biggest advantage as you could do it as fast and simple with classic commands (Insert Block or Attach). With DesignCenter you can also copy content like Text Styles, Dimension Styles, Blocks, Layers, Layouts, Linetypes, Multileaders, X-references from any drawing. Now this is much faster and easier than creating everything from scratch. 1. Ctrl+2 / Open DesignCenter. 2. Folder List / Click the folder containing your drawing. 3. Drag´n´drop drawing´s .DWG file from the list on the right side of DesignCenter onto your drawing area. 4. Specify insertion point, X and Y scale factor and rotation angle. 2. Folder List / Click the drawing´s folder / Click the .DWG file / Click the content group, e.g. Dimension Styles. 3. Drag´n´drop the name of dimension style you need from the list on the right side onto your drawing area. 4. The copied dimension style should be available in all Dimension Styles lists. Quick access to organized and commonly used materials, hatch types, styles, blocks, etc. can save you some time. Once you create them in your drawing, it is very simple to move them to Tool Palettes. For example, hatch with assigned pattern type, scale and other settings, can be accessed from Tool Palette in any drawing with just one click. 1. Ctrl+3 / Open Tool Palette. 2. Right-click menu on a blank area of any palette / New Palette. 3. Enter the name of a new palette, e.g. Hatches. 1. E.g., draw hatches with all necessary properties (layers, colors, scales, patterns, etc.). 2. Drag´n´drop one hatch at a time from your drawing on your new Hatch palette. 3. One click on a transferred hatch type activates Hatch command with all transferred hatch properties. 4. E.g., you can repeat the procedure for different line types. Draw Polylines with different properties and drag´n´drop them onto a new palette. By clicking the arrow next to Polyline icon you can use various commands to draw your line type. 1. For better organization it is advisable to create a separate folder on your disk where you should save all your blocks from your block library. 2. Draw a block in a new empty drawing using ´0´ as current layer. If your block elements are a part of your drawing, you can save them in a separate .DWG file using Wblock command. In the Write Block dialog box you define Base point, Select objects, File name and path of your .dwg block drawing. Layer properties ´travel´ with blocks. Again, if you don´t want any weird layers to be present in your layer list after inserting blocks, it is best that all blocks elements belong to layer ´0´. This default layer is present in every new drawing and it doesn´t mess up your layer list. 3. Ctrl+2 / Open DesignCenter. 4. Folder List / Click the folder containing your blocks (.DWG files). 5. Drag´n´drop the .DWG file from the list on the right side of DesignCenter onto your new Tool Palette. 3. Enter the name of a new group. 4. From the Palettes list you drag´n´drop palette to a new group. 5. Close the Customize dialog box. 6. Shortcut menu on the title bar of Tool Palettes / Click the palette group name to display. 1. Right-click an icon on Tool Palette / Specify Image from shortcut menu / Browse for any raster image. 2. Right-click an icon on Tool Palette / Properties from shortcut menu. 3. Tool Properties dialog box / Enter name and description. Different designers use different styles to produce accurate and attractive drawings. As long as they do all the work by themselves this is not a problem. However, if you share your drawings with other associates in your design team, it is quite likely to happen that they won´t be able to plot the same drawing style as you. They might receive missing font messages when opening your drawing or missing plot style when plotting and even show different Linetype scales on their screen. To avoid this, it is best to set up your own company drawing standards. Everyone in your design team should use the same drawing template (.dwt). This new drawing should contain predefined Units, Styles (Text, Dimensions, Tables, Multileaders, etc. ), Layouts with Title Blocks, Linetypes, Lineweights, global Linetype Scale and perhaps even some common Layers and Fields. This predefined content saves time as it is ready to use and avoids missing settings when sharing drawings with your design team. Everyone in your design team should have the same resources of hatch types, linetypes, block libraries, materials or styles. If you organize them on your tool Palettes, they will be quickly accessed in any drawing. 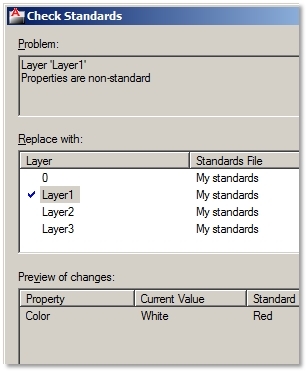 Not many users know, but AutoCAD can create a Standard .dws file which contains predefined standards for Layers, Text Styles, Dimension Styles and Linetypes. You can assign this .dws file to your drawing and you´ll get a notice for any violation, e.g., wrong Layer color or Text Style height, and even have the possibility to automatically fix errors. 3. Close the .dws file. 3. Settings button opens CAD Standards Settings dialog box where you can define standard violation notification and check standards settings. 4. 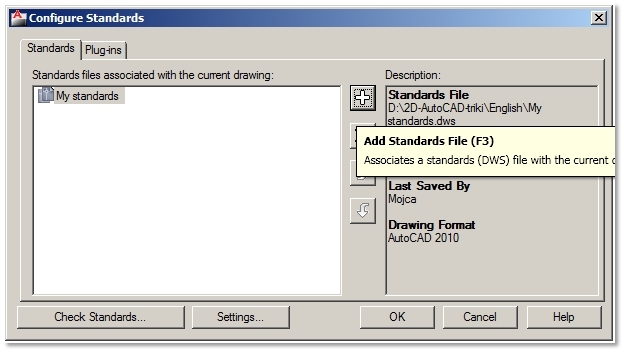 Check Standards button checks for any violations in your drawing. 1. By default every violation of standards is notified in a bottom right corner of your screen, e.g., if you change your standard layer to non-standard color, you will receive a Standard Violation notification. 2. Click Run Check Standards. 3. Dialog box Check Standards lists all violations. 4. Fix button changes them to standards. 5. Next button shows the next violation. Clicking on icons is the quickest way to access commands. But sometimes you have to display the whole toolbar to access the one icon you need. Many displayed toolbars also use up your drawing area. To save up your space and quick access to your frequent commands it´ll be best, if you create your own toolbar including icons you want. 3. Enter the name of a new toolbar. 4. Add icons to your toolbar / Command List / click an icon / Drag´n´drop it on the name of your toolbar. Extra tip: You can also add icons to existing default toolbars using the same pro﻿ced﻿ure. Drag´n´drop any icon from Command list on the name of existing toolbar, e.g. Draw. 5. After adding all icons click Apply and OK.
6. 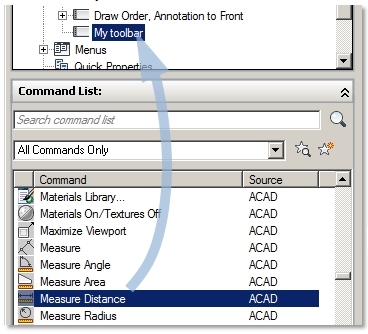 If your new toolbar doesn´t automatically show up on your screen, you can display as other AutoCAD toolbars / Tools menu / Toolbars / AutoCAD / Click the name of your toolbar. If you use one command more than once, it will be faster to simply repeat it than moving back to ribbon, toolbars or menus. There are at least 4 ways you can repeat last command. 1. Enter always repeats last command. 2. Shortcut menu on the drawing area / Repeat Command. 3. Shortcut menu on command lines / Recent 6 Commands. 4. Type Multiple / Type command name, e.g., Pline / The command will be repeated until you press Esc. Multiple doesn´t repeat commands that open dialog boxes. Extra tip: You can also change aliases in Edit Aliases list; however this is not advisable unless you are an advanced user familiar with migrating acad.pgp file after upgrading your software. Sometimes you have to type the same input several times, e.g., typing the same distance or command name. Repeating the last command by simply pressing Enter shouldn’t be a problem, but if it’s not the last command we want to recall, Enter won’t work. Using a system variable you can recall all your previous inputs (values, measurements, command names, etc.) from last to first or vice versa simply by clicking Arrow keys Up and Down on your keyboard. Type Inputhistorymode / Set it to 0 (zero). You can specify more running objects snaps in the Drafting Settings dialog box by right-clicking the Osnap button on the status bar and Settings command. However, with several object snaps on it might happen that more of them apply to the same point. If the one you need doesn’t show up, you can cycle through them by pressing Tab before specifying the point. Too many active object snaps can sometimes be annoying if you want to specify a certain point that isn’t an object snap. To avoid this it is recommendable that you keep active only the most often used running object snaps. You can still locate other certain points using a single object snap. First select a command / Press Shift and right-click to display the single Object Snap menu. When starting a project you usually first launch your AutoCAD, if necessary select your profile, open your new drawing template and activate your workspace. Well, you can narrow down these tasks to just one, that is by only launching your AutoCAD.